Do you know people who use words in comparisons but do not really know what those words mean? Who refer to a drizzle as a typhoon or a splash as a tsunami? Do you have any idea if your comparisons were correct or whether or not you have made the right associations? Read on and never be surprised by such things again. Find out what is the difference between a typhoon and a tsunami. A typhoon is a very powerful spiral-shaped storm usually formed in the Western part of the North Pacific Ocean between 180° and 100° east, as they are formed in low atmospheric pressure areas. They are called typhoons in the Western Pacific, hurricanes in the Atlantic Ocean and Eastern Pacific, and tropical cyclones in the Indian Ocean. They can feature low- to high-speed winds and are accompanied by rain in all cases. The severity of these storms ranges from category 1 to 5 on the Saffir-Simpson scale, with 1 being the lowest and 5 being the highest intensity recorded. Typhoon formation depends on the evaporation of warm ocean water. The warmer the water, the more powerful the typhoon is. When seen from space, the spiral of the typhoon spins counter-clockwise in the northern hemisphere and clockwise in the southern hemisphere. A characteristic of the typhoon is the “eye”, a gap formed in the clouds, which can be seen from above the formation. The eye is usually an area with no clouds, a few tens of kilometers wide, and it forms when the wind speed exceeds 85 miles per hour. A tsunami is a phenomenon generated by an earthquake, volcanic eruption or landslide in an area near water, causing the dislocation of a large body of water. 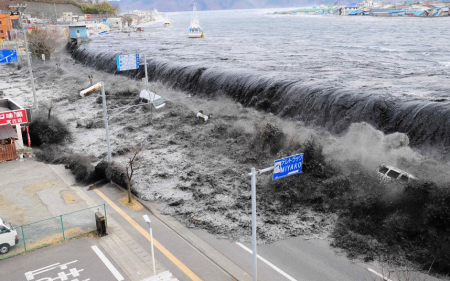 The term is Japanese for “harbor wave,” as areas near the ocean are usually the ones affected by the phenomenon. It is also often improperly called a tidal wave because when the movement starts and the water level starts to rise, it resembles the rising tide. However, a tsunami has nothing to do with the tide. When an earthquake happens somewhere in the ocean, water travels toward the shore, rising as it approaches. Unlike regular waves, tsunamis do not break, so they hit the shore with a lot of power. They are very difficult to predict, and scientists have yet to figure out why some smaller earthquakes can cause tsunamis while bigger ones may not. So what is the difference between a typhoon and a tsunami? First of all, a typhoon is a heavy storm, while a tsunami is a giant wave. Typhoons can only be formed at latitudes that within 10 degrees north or south of the Earth’s equator, as they are formed by warm, low-pressure ocean water and the Coriolis force (the force that comes from the rotation of the Earth). Tsunamis, on the other hand, can be formed in any large body of water, be it an ocean or even a large lake. They have natural causes but can also be caused by detonations and human intervention, which leads to the displacement of a large body of water. Both of these events can cause a lot of damage and loss of life. Tsunamis cannot be predicted with much accuracy, and people in areas that could be affected have to keep an eye out and head for higher ground as quickly as possible. Signs of an imminent tsunami often include receding water accompanied by a suckling sound. Typhoons can be predicted, as the swirling clouds can be seen from above. 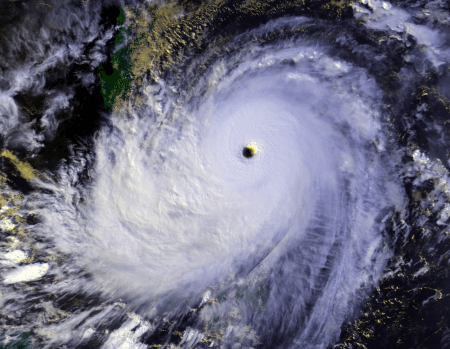 The intensity of typhoons can be predicted as well, unlike tsunamis, whose intensity is usually assessed after the damage has been done.